The primary need for air conditioning is that it effectively cools the air in your home. Many people don’t even consider an important secondary function, which is to improve the air quality. When you improve the air quality in your home, you make it more comfortable and reduce the level of pollution. This is very helpful if your family has any allergies to pollen and other irritants. Let’s take a look at some of the options for improving the air quality in your home. This is one of the simplest options to improve the air quality in your evaporative air conditioning system. If your ducts are not cleaned on a regular basis dirt and debris can build up over time. When the system is in use, the ventilation system will circulate pollutants throughout your home. A thorough professional cleaning will remove the cause of the pollution and ensure that your air ducts are circulating cleaner air. One of the best methods for improving air quality indoors is to install an air purification and cleaning system. There are two different options to consider when choosing to go this route. The first kind of system is a mechanical barrier or air filter that is installed into your ductwork. As air passes through your system, it passes through the filtering medium and becomes trapped. The level of filtration can vary, different materials can be effective at filtering differing levels of particles. Periodically the filters are changed or cleaned to remove the pollution and then the system is ready to be used again. The second option is to install a more high tech solution, which is commonly referred to as an electronic air cleaner. Most of these systems use an electromagnetic precipitator to charge pollutant particles with electricity and then trap them on a collection plate. This plate can then be removed and periodically cleaned. It may be the case that you have a humidity imbalance in your home that is adversely affecting your indoor air quality. If there is too little humidity, you could experience splitting in your woodwork and flaking, chipped paint, as well as health issues, such as sinus problems and a dry, sore throat. If there is too much humidity the air will feel oppressive and stuffy, the growth of mould is more likely, and wood can rot easily. A good option, in either case, is to install a whole house dehumidifier or humidifier and restore some balance. If they would like to know more about improving their air quality using evaporative air conditioning, Perth residents should contact us. 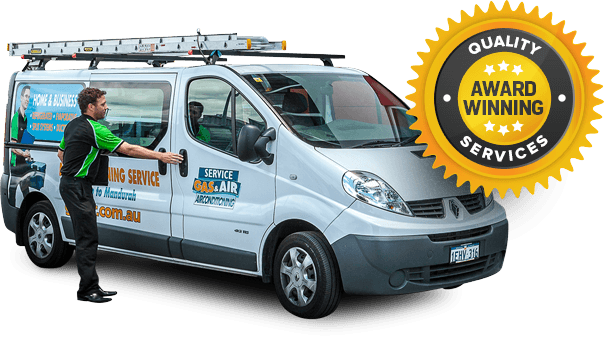 Here at Gas & Air, we have a great deal of experience in dealing with all aspect of domestic and commercial air conditioning. Get in touch with us, and we will be happy to discuss your needs in greater detail.